This past weekend I said goodbye to Harborgrove and went to the one place on the grid I knew I’d rediscover my sense of wonderment. Calas Galadhon is larger than when I first discovered it last year, and it remains the crown jewel in my list of the Wonders of Second Life. There seems to be more visitors roaming the Calas sim group these days, but there is always space to find your own space. In fact, I still find myself challenged by the forest and the Misty Mountains. Harborgrove was the largest plot I’d ever landscaped, but it was now empty and time to say goodbye. The vastness of the Calas sims simply cannot be captured in a single photo. This is a panorama of the upper four sims. Shortly after entering the forest, I stopped on a makeshift bridge and exchanged meaningful glances with a curious raccoon who came to have a drink from the stream. I continued deeper into the forest along a rough path, but even though the scenery looked familiar I was becoming more and more lost. Finally, after wandering hither and yon, I came upon that darling cottage I had discovered that first day I came to Calas. I swear this to be true, no matter how many times I come to Calas, I still cannot seem to find my way here without getting lost. I suppose I could use my cam and that would solve the problem, but then where would the fun be? 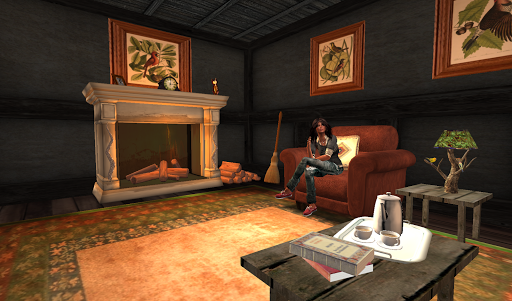 Fortunately, the cabin was empty, so I took up residence in my favorite spot by the fire. Here, in a place like this, you have a chance to experience the power of immersion. Looking at these photos you may comprehend what immersion is, but by it’s very nature it must be experienced. This spot, this warm little house in the vastness of the forest reaches deep inside my soul. Isn’t that amazing? I know people who see scenes like this as a two dimensional array of pixels that resemble a painting or a cartoon, but if you open up your spirit I don’t see how anyone cannot feel this peacefulness and safety of this place. Probably, I am too ready to enter the world of fantasy; afterall, I can still find endless fascination at Disneyland (and without smoking herbs… *giggles*). Anyway, this is where I spent a good portion of my morning but even in this world there is a time to leave, and I decided to try to walk out of the forest. Shortly after leaving the cottage, I was lost again but followed a stream toward the coast. Toward evening I made it to the coast, where I found a path that led me back to the bridge and into the town. 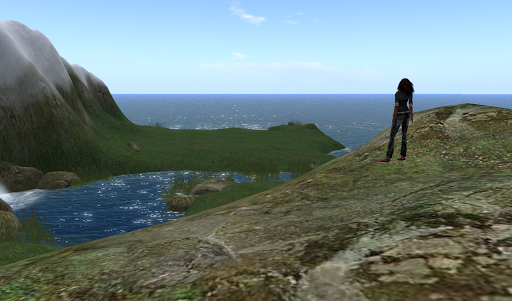 Once again, Calas Galadhon filled up my spirit. And once I made it home I went on the mother of all shopping sprees (more on this to come). The takeaway is, if you haven’t been to Calas lately, it’s time for a visit. This entry was posted in Exploring and tagged Beautiful Regions, Exploring, Photography, Second Life. Bookmark the permalink.